Get the most out of your games with Thunderegg Productions' OSR Sci Fi GM Screen. Designed with the White Star Roleplaying Game's rules in mind, it's also compatible or easily portable to other SF OSR RPGs, including Stars Without Number, Hulks & Horrors and more. In addition to being a GM screen, we've included a printer-friendly version so you can have one-page combat references and player handouts. 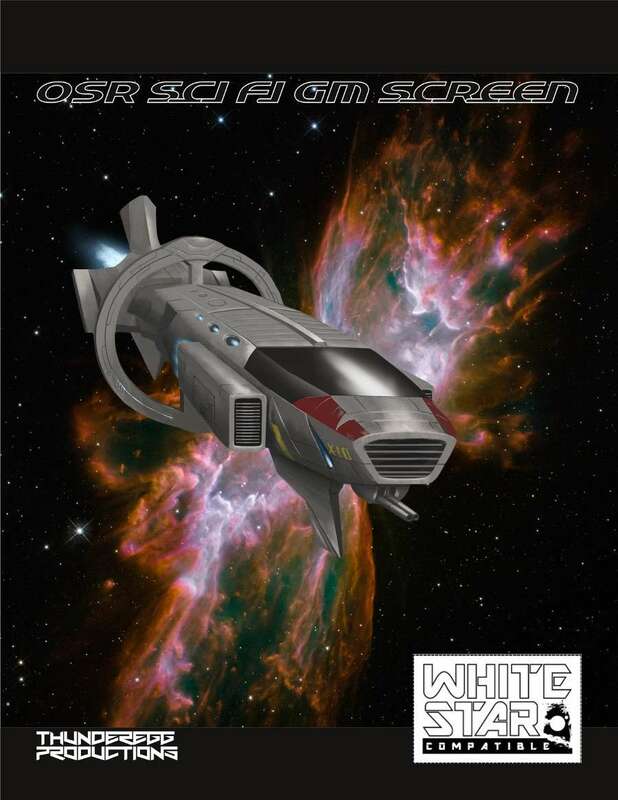 The player side features a beautiful cover page, a summary of both melee and starship combat rules, an example sector map with an FTL travel system and descriptions of each world. The GM side includes the same sector map, planetary descriptions that also come with GM secrets, a combat summary, a random mission and reward generator and a convenient one-roll enemy generator that scales from mooks to bosses. These pages are designed specifically to be used as inserts for OneBookShelf's customizable GM screen. The sheets are in portrait orientation. If you purchase the GM Screen with these inserts (there's an option during the checkout process), then you get the inserts free! As an added bonus, the PDF includes two extra pages with brand new racial classes, the Shax Implacable and the Sha-iz Operative. The new classes were created to be compatible with the system developed by Bill Logan in Hyperspace Messenger 03- Aliens. Give it a look, here, it's fantastic. Grab this screen today and supercharge your RPGS! This title was added to our catalog on August 03, 2015.